Wealth is created in times of chaos. In today’s real estate market there is often chaos in the foreclosure market! In recent years, foreclosures have been at some of their highest levels ever. Don’t get left on the sidelines the next time this type of real estate opportunity comes your way – just because you were not prepared with the paperwork you need to close your deals. When you get started as a real estate investor, the volume of paperwork required to get the job done is confusing. You want to be sure you are safe, LEGAL, and covering your backside! Land trust agreements, lead paint forms, escrow letters – the list goes on and on. When the phone rings at your office, you want to focus on getting the house purchased. You don’t want to waste your time hunting for forms or calling your attorney to create documents for each deal. 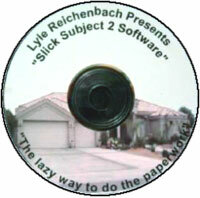 Lyle Reichenbach had the same problems and he developed this software package called "Slick Subject 2 Software"®. It’s the lazy way to do the paperwork for subject-to and short sale deals! He made a decision to get the paperwork mess organized once and for all. He pulled together all the documents needed to do "subject-to" and "short sale" deals. Then he realized that, to make this software really brain-dead simple, the program had to be set up so the forms could be filled out with minimal input. So with this software you can type in, say, the property address of 123 Main Street and have that filled out on all the required forms instantly. What a time saver! This software has all the "subject-to" paperwork so you can custom print your transaction in minutes, not hours, and know you have every necessary form. "Slick Subject 2 Software" includes all kinds of BONUSES: Sample hardship letter, EPA forms, full-color lead paint booklet etc. – All the things a bank would want from you for a short sale. There’s even a letter where your Seller signs and says "please allow [your name here] to negotiate a settlement on my/our behalf"! "Slick Subject 2 Software" is a mail merge program that works with Microsoft Word®. For each transaction you can print out a complete checklist so you know you are not missing any important documents. You have all sorts of forms to protect you, the Investor, and you have complete control! "Slick Subject 2 Software" gets rave reviews at REIA meetings. At one meeting, Lyle sold 28 software packages in just five minutes. This is an absolute steal at $99.95. Everyone says it’s worth much more. I was at a seminar of a famous "guru" who came up with something similar – but that "guru’s" program is not for sale! You must attend his $3,500 bootcamp to receive a copy!! GET YOUR HANDS ON THIS time-saving professional "Slick Subject 2 Software" system now and step up your game! Let me quote this guru: "This software is such a time saver that it is worth MORE than the cost of the seminar because of the time savings to draw up your paperwork!" So just think of the money you can save at your closing agent alone if they don’t need to prepare this paperwork for you! And, for the uninformed, the land trust alone can cost hundreds of dollars to have someone prepare. One investor paid $350 to have land trust paperwork drawn up and I met an investor who paid over $1,000 to have her paperwork drawn up. Sample Cover Letter to Loss Mitigation Dept. And best of all “Slick Subject 2 Software” creates all your closing documents in minutes. Just think of the confidence you will have on your next deal knowing that you have not forgotten anything! The "gurus" charge $100’s for their programs — and they have less information and are not as complete! This powerful software was created by an investor who decided to share it with fellow investors.